Did Firefox block your Flash Player? And now you have to click allow every single time it warns you about Flash content on the site you’re trying to surf? This is how to Stop Firefox from asking me about blocking Flash and allow Firefox to always activate this plugin. This article is to help those people who like Flash and wish to Allow the Adobe Flash Shockwave Player to Always Activate and avoid having to either white-list all the websites you wish to experience flash with or clicking allow via the popup menu displayed each time you visit a website with Flash content. Below I have included a screen shot of what we will be eliminating. Over recent months the Mozilla Company has begun disabling versions of Adobe Flash Shockwave Player in the Mozilla Firefox Browser. The reason for this according to Mozilla is its discovery of flaws in the coding behind Flash player which open up exploits that a malicious person with appropriate skills (”a computer hacker”) could take advantage of where by opening holes in a web surfer’s security via the Flash interface. Supposedly their are more than one exploit that needs attention, both in the language used by Adobe Flash (Flash uses a scripting language called Action Script, currently version AS 3) as well as the BitMapData component of the Flash software. I included above an image of my Firefox Plugin screen to demonstrate what it looks like when you have properly upgraded your Flash Player to the latest possible version. As you can see in the image above the “Always Activate” option is selected and in affect. The problem those of you are having is that unless you have Adobe Shockwave Flash Version 18.0.0.209 firefox will not allow you to choose to automatic activate the plugin and will require you to update your plugin software. This situation was a recent development in compatibility issues between Mozilla and Adobe. Please note that this solution may not remain applicable for all time. Software in addition to Company polices and compatibility change regularly. 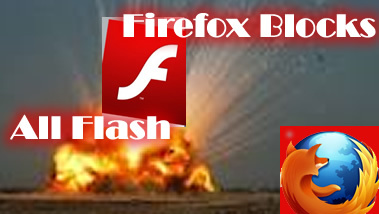 Currently with the versions mentioned here this solution will stop Firefox from disabling Flash and asking to Allow flash each time you visit a flash web page. This information was obtained using Mozilla Firefox Version 39 in combination with Adobe Shockwave Flash Player Version 18.0.0.209 and will allow you to configure your Firefox plugin to allow activation automatically of Flash without manually action and prompting. While using a version of Flash prior to this version within Firefox V39 you will discover that each time you visit a page with any flash content at all you will be prompted to allow access to the flash player despite the security concerns at play. This last segment is something I wanted to throw out there for those of you that read this article. As more and more companies seem to jump on the band wagon of hating Flash content I have to wonder about current and future implications for the internet advertising market. It seems to me that this type of automatically disabling of Flash could creates huge problems for many companies or agencies specializing in online advertising which allow their customers to both supply and display Flash ads within their current system. I have to wonder which places have built in precautions to prevent situations like this from affecting either publishers or providers of flash content. July 14th, 2015 with no comments. Read more articles on Technology. You can use these XHTML tags: <a href="" title=""> <abbr title=""> <acronym title=""> <b> <blockquote cite=""> <cite> <code> <del datetime=""> <em> <i> <q cite=""> <strike> <strong> .